Canister vacuums are a versatile cleaning tool. They’re easy to use, environmentally friendly, lightweight, and most importantly, work quietly compared to upright models. Purchasing a new canister vacuum cleaner probably seems like a simple task, but once you start to explore all of the options, features, brands and accessories, the process can quickly become overwhelming. After spending hours on researching, I came up with a list of the best canister vacuum based on rating, performance and budget considerations, which you can buy right now. Here are our top picks for the best canister vacuums. This canister vacuum is a powerful product that is designed to make life easier for houseproud homeowners. It looks smart in marine blue, but how does it perform and is it worth the asking price? This cleaner is made up of two parts, the large blue canister with a carry handle and the head and handle which are attached via a flexible tube. The result is something larger than an all-in-one hand-held vacuum cleaner but with more space, while still being more practical than a larger model. It also looks very smart with its bright blue body and minimalist, curved design. That nozzle is actually an ‘Electro Plus’ floorhead, which is designed to be ideal for vacuuming medium and high pile carpets. It also comes with a Parquet floorhead, which can be used to clean smooth surfaces like wooden floors. The handle uses a telescopic design allowing it to be lengthened and shortened as needed. Other attachments include a dusting brush, upholstery tool and crevice nozzle. Accessories can be stored on the vacuum cleaner by a handy VarioClip. In terms of features, this gives you an ‘air clean’ sealed system that benefits from HEPA air clean filter. That means it can help to remove dirt from the carpet but also particles from the air: 99.9% of particles to be precise. The system has six different speed settings, providing a lot of control and an impressive max output thanks to the 1,200-W Vortex Motor driving the system. The Electrolux EL4335B comes with a 21-feet cord and an 8-foot hose as well as a telescopic wand to give you an extended cleaning reach. It is compact and lightweight making it easier to move around the house as well as up and down the stairs. It has both vertical and horizontal parking positions for easy storage. It comes with versatile tools such as a crevice tool and a dusting brush that can conveniently be stored on the handle. Its upholstery and bare floor nozzles make it a versatile vacuum for all your home cleaning needs. The Electrolux EL 4335 uses an advanced HEPA filtration system that is capable of capturing 99.97% of allergens, fine dust, and other unhealthy irritants in your indoor air. It is also quite efficient in eliminating pet hair from carpets and couches. The HEPA filter is completely washable and reusable. It has a slim design with a bagless dust cup that opens easily when emptying. It comes with a 5 year limited warranty from the manufacturer. Finally, the Electrolux EL 4335 is nonetheless one of the best canister vacuum on the market today. It is easy to use, provides fast cleaning on both bare floors and carpets, and is quite easy to empty unlike other products. Cleans bare floors and carpets efficiently. The Dyson Cinetic Animal is designed for households with pets that shed hair frequently. It is able to remove fine dust and pet hair from carpets and other surfaces with ease. It has an articulating handle that provides easy and versatile cleaning. The handle can rotate 360 degrees allowing you greater control while cleaning. The vacuum is HEPA certified for asthma and allergy. Overall, the Dyson Cinetic Animal is a versatile canister vacuum that is ideal for cleaning hardwood floors, tile floors, carpets, pet hair, and stairs. Provides a thorough clean on stairs and on the edges of ceilings. This is a corded hard floor canister vacuum with impressive features. It is powerful enough to give hard wood and other types of floors a thorough clean yet gentle enough to clean delicate surfaces. Aside from that, it can be efficient when cleaning rugs, and low pile carpets. This vacuum is equipped with suction settings to give you control when it comes to the power it has to clean. Another is its automatic height adjustment capacity to help you comfortably clean hardwood floors and different surfaces. It has soft non-marking rubber wheels complete with felt treads. It is lightweight and easy to move from one room to another in your home. It comes with fingertip controls that you can use to control suction for safe cleaning on delicate surfaces such as drapes and upholstery. The product has extra soft bristles that provide a deeper clean as well as a host of other useful tools for fast and easy hardwood floor cleaning. It comes with a 2 year warranty. However, users had observed that because this unit has a short power cord, you may be required to plug it a couple of times to complete a cleaning session. Overall, I would say that it is a reliable product, but you may doubt the small motor it has that can give a strong suction power. It can also vacuum low pile carpets and rugs with ease. 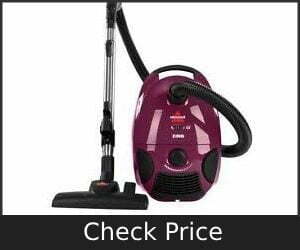 One of the most lightweight model maybe, this Bissell Zing bagged vacuum weighs a good 12.5 pounds, and is flexible in terms of handling. This model features powerful suction that cleans dirt effectively on carpets and bare floors. As the name of the product indicates, it is a bagged vacuum, wherein it is using a paper bag to store all the dirt and easily dispose of it. Also, when it comes to performance, this canister vacuum has quite a strong suction to effectively clean edges. Users have observed that even though it has a strong suction, this vacuum cannot help when it comes to cleaning any pet hair left on your furniture. Also, it is not equipped with a motorized brush, which may affect your carpet cleaning session. Aside from the small spaces, vacuums are most likely to be used on carpeted areas. With this not having a motorized brush, it may not be as effective when used on carpets, so you will not be that assured about having dust totally cleaned off. Another thing is that you will want to use this in its full- capacity, but doing so, it may lead to releasing a loud noise. Overall, I’d recommend this inexpensive canister vacuum if your home mainly has hardwood/tile/bare floors, and small carpeted area. If using on hardwood floors, be sure to the softer brush attachments made of “horse hair” so you don’t scratch them. Panasonic is a known brand when it comes to producing home appliances that will help you ease your daily life. With this Opti Flow cleaner, the game is still the same, as it is considered a powerful and quality item at an affordable price. This Panasonic vacuum cleaner is a lightweight appliance with a carry handle for a much comfortable cleaning experience for you. It is powered by 12 amp motor for efficiency and a separate large bag caddy for easy disposing of dirt. However, some users have observed that this vacuum cleaner can be a little bit bulky which may be a concern when it comes to storage space. Plus, they have had observed that the product may not be as reliable when it comes to edge cleaning. Okay, so one of the key benefits that this type of vacuum can give you is the ability to comfortably and easily clean the spaces that may be hard for you to reach. With the Panasonic Opti Flow, it may have a lot of good qualities but if you are concerned about the reach, then you may want to have other options. Considered as one of the most affordable canister vacuum cleaners in the market now, and is one of the most considered vacuums as it can go beyond expectations in terms of its cleaning capacity. This vacuum is noticeable for the convenience it can provide to its user through its flexibility, which makes it easy to maneuver. It is also a good vacuum for those who do not want to worry about storage space or the bulkiness that they carry while they clean. The suction control of this vacuum is reliable when it comes to cleaning curtains, and floor curtains alike and assure to remove the smallest dust particles. However, it will not perform well when you clean on carpets. Also, some users have observed that the power cord can be a bit shorter, especially when you will be cleaning a large room. This Bissell Zing vacuum is definitely made for those looking for a cheap yet effective appliance. Most of its cons are tolerable like the noise it may be producing during use, but before you commit, make sure to have checked any other reviews by genuine users. Eureka Mighty Mite is one of the most compactly designed, easily handled, maneuverable vacuum. It is lightweight, has excellent suction and it is easy to use. It can be used for both home and car cleaning. Works extremely well on hardwood floors. Fits under all furniture and gets everything up!! With a compact size, this vacuum is equipped with a good 12 amp motor to help you clean your floors in no time. Plus, for a more convenient cleaning process, this machine will give you a good 20-foot long cord to comfortably clean your whole space. Plus, it automatically shuts off so you do not have to worry about any intensive electrical damage due to overheating. With the positives, come the negatives. This unit is not that great for high pile carpets due to the fact it does not have actual spinning brushes. One downside is the hoses get kinked up when they get a little old. Somewhat noisy; If the disruptive sound is a problem for you, you may want to look for a different model. If your house is mostly carpeted, you might want to choose another vacuum. A European brand, Miele has been known for having a reliable vacuum cleaners line that can help you full- proof the cleanliness of your home. Miele canister vacuums are a good product that is also backed up by a strong company who stands up for their brand. This C3 limited edition is a quality yet affordable vacuum, which can best help you reach places with its 36-foot radius capacity. Plus, it is rare for a canister vacuum to be able to effectively clean out carpets and is quite silent during operations. It offers also about six-speed settings to help your cleaning pacing. Some users have observed that this may get a bit heavier when used for a large home or space, especially if there are a couple of staircases. This does not come with a HEPA filter, but you can simply buy it separately. Overall, I think this is a great and powerful cleaner that can cater to your general cleaning needs. It is probably a suggested vacuum to use for anyone looking for convenience and comfort while doing a tiring chore. See our similar product review here. Another Bissell product, the 4122 bagged vacuum is a multi- surface vacuum cleaner with a couple of good features such as: having an adjustable power, its multi- surface functionality, its telescoping wand, and a full bag indicator. It is considered to have a reasonable price for its capacity, ease of assembling and usage. For convenience, Bissell is light in weight to, so it is very much easy for you to handle it, especially with its additional wheels. However, some users may have observed that it does not apply efficiency to all surfaces, so it is best to look for testimonies that match your place. Another is that, with its size and weight, it may have a factor when it comes to your posture. Overall, I think it is an “all right” vacuum that you can definitely consider. Just double check on whether or not it compliments your height for posture purposes. This multi-floor vacuum by Dyson is probably one of the units with a low price point of the company, but gives the same quality and efficiency when it comes to the cleaning process. It has an updated Radial Root Cyclone technology to add power to its suction. This Dyson Ball vacuum is designed with a Trigger head Tool, which can be controlled with an on and off switch to make cleaning more comfortable for you. It is no secret that the brand is known for its vacuum cleaners, and now, they are innovating and further developing the “ball” system to offer ease in mobility. However, impressive that is this unit, it is mainly made maybe for dust and small particle dirt, as this cannot process any dirt that is sized that of a marble. Plus, it may give unnecessary worry for users because of the heat that the housing can get for extended usage. This Eureka AirExcel Compact is equipped with a cyclonic technology that will empower and support the suction capability of the unit. In addition to that, this vacuum comes with a HEPA filter and a washable foam filter, for a more efficient dirt collection system. It is designed to have a good 9 amp motor to power your cleaning sessions, and a reliable 16-foot power cord to help storage easier. Plus, it is light in weight, with just eight pounds making it easy to carry and portable. However, you will want an appliance that you can deeply rely on when it comes to cleaning, and this Eureka AirExcel Compact cannot do deep clean on your carpets or rugs. Choosing a worthwhile vacuum investment means you are given minimal items to manually clean. Why Use This Type of Vacuum? First and foremost, let me clarify the difference between a canister vacuum and an upright vacuum cleaner, as you may be thinking of the other. The main difference between the two is that a canister vacuum is placed behind you while the latter is always in front while being used. Although, the type of vacuum you will be using is totally dependable on what you prefer, but why should you consider using a canister vacuum right? For some reasons, such as it may tend to be smaller in size but with a longer hose to enable you to reach small spaces efficiently. Another reason is for convenience, a canister vacuum will not be requiring you to change hose when you switch from floors to dusting, unlike when using an upright vacuum. If you are a mom, or simply someone who does not like the noise a regular vacuum commonly releases, then the canister vacuum is the one for you as it tends to be much quieter. Okay, so maybe you are not yet totally sold on the reasons why using a canister vacuum may be good and beneficial for you, but have you taken into consideration that maybe there had been signs that are leading you to even considering the possibility of it? If you are not sure, then here are some of a tell on whether or not your surrounding had been conspiring to lead you to use this canister vacuum. These are the outright signs that you may actually need to consider using a canister vacuum for some reasons like, they can help you easily reach the areas under some furniture like your bed that can be hard to move. Another is that canister vacuums can be light in weight so it is much easier for you to carry them around your house. It is also considered to be the best cleaning tool to be used on hardwood floors and staircases. Here is the thing, canister vacuums may not be for everyone especially if you are looking for something with a larger dirt bag, or depending on your preference. Purpose. In every item you buy, you should know what their purpose is. How will they be beneficial to you and your needs? By knowing the main reason why you will be purchasing a vacuum cleaner, you will be able to filter out better which type is best suited for your needs. Cost. Of course, your budget is one of the main factors you have to consider when buying any appliance. This will give you a price limit, and help you better filter out what the best ones are within your capacity. Also, by cost, it means you have to take into consideration whether or not it is durable enough to give your money’s worth or will it potentially cost you to drop more money when it comes to repairs. Performance or Suction Power. Okay, this one may be a little technical for the average Joe, but the suction power is an important consideration to take as it will help you determine the vacuum’s capacity when it comes to cleaning out dirt. Filtration System. Another important factor to check is the vacuum’s filtration system, as this will help ensure that anything that had been sucked in while you clean will remain inside. This will keep your air from having any uncontrolled contaminants. Aside from that, your filters may be a part of a system to help better its maintenance, thus helping prolong the product life and its efficiency. With or Without Bag. Deciding on whether or not you should choose to use a disposable bag is an option you can, later on, decide maybe or right ahead, if you already have an experience. The hassle of cleaning your dirty chamber once in a while may be okay with you, but if not, you may be comfortable with having a disposable bag ready to be thrown away every after you clean. Totally up to you. Hose and Nozzle Length. Using a vacuum cleaner, you have a notion in mind that you will be given enough capability to reach impossible or small spaces which you cannot usually reach in a manual sweeping. You must always see to it that the length of your hose and nozzle is long enough to reach a good distance under the furniture. Noise Level. For some, cleaning the house is done usually when their kid is sleeping, or simply on their free time. You will want a machine that will not be bothering anyone, even you when you clean. Canister vacuums tend to be much quieter than an upright vacuum. Consumer review. One of the best references to guide you when choosing the units and even brands is by reading the reviews that other consumers had done. This will give you a better grasp on what the product specs are, and what you may expect. Warranty. Of course, with any gadget and appliance, you should consider the warranty that they are given. This will protect you from purchasing any defective unit or simply from further spending for repairs when your unit is new. When choosing the right canister vacuum for you, keep in mind the criteria and factors that will contribute to any aspect of the purchase. You want to look for a worthwhile investment that will help you lessen thing or spaces that will or may require manual cleaning. Hope you like our best canister vacuum 2019 list. Investing on a vacuum means investing on your health too, so choose wisely.